Who doesn’t love a good old fashioned, giant meatball on top of their pasta?! Something about a softball sized meatball just makes my heart happy and feel like a kid again. But since I don’t have my adolescent metabolism anymore, and still want that big ol’ meatball feel good meal, I had to make some adjustments. 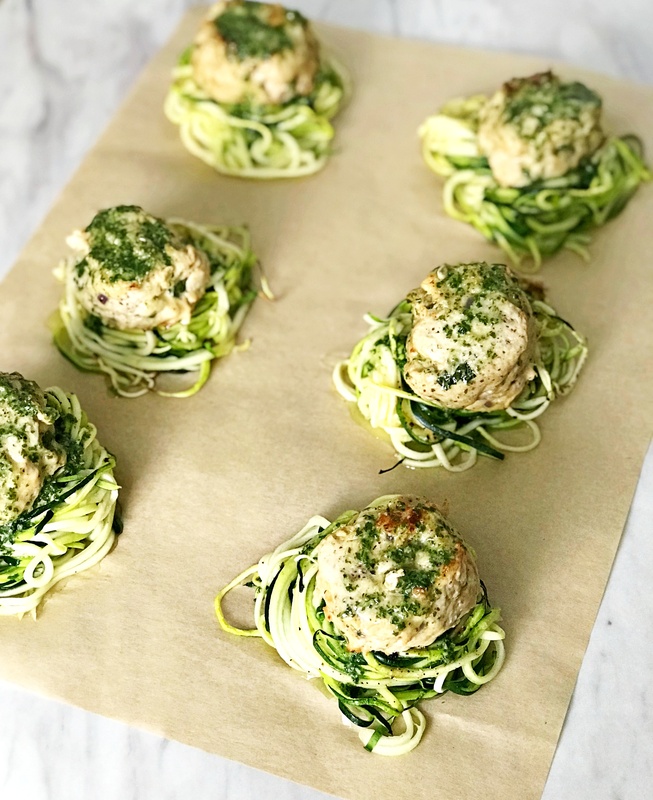 Lo and behold this wonderfully satisfying juicy turkey meatball recipe, atop a nest of ZOODLES. That’s right people, a perfectly crafted pedestal of zucchini noodles to prop up the most beautiful turkey meatball! This meal is the real MVP because it tricks your brain into thinking you’re eating spaghetti and meatballs, when you’re actually just eating a bunch of lean protein and vitamins. This meal is very low carb, high in fiber, and packed with vitamins. 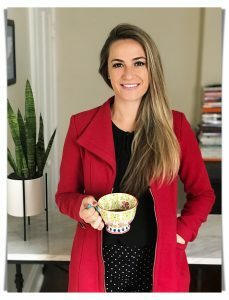 Gluten free, keto, paleo, and whole30 approved… that’s called a win-win-win in my book! Start by prepping your zoodle nests. This can be done the night before or at the start of cooking. Using a spiralizer, slice two large zucchinis and set aside. If making ahead of time, store in an airtight container in the fridge. 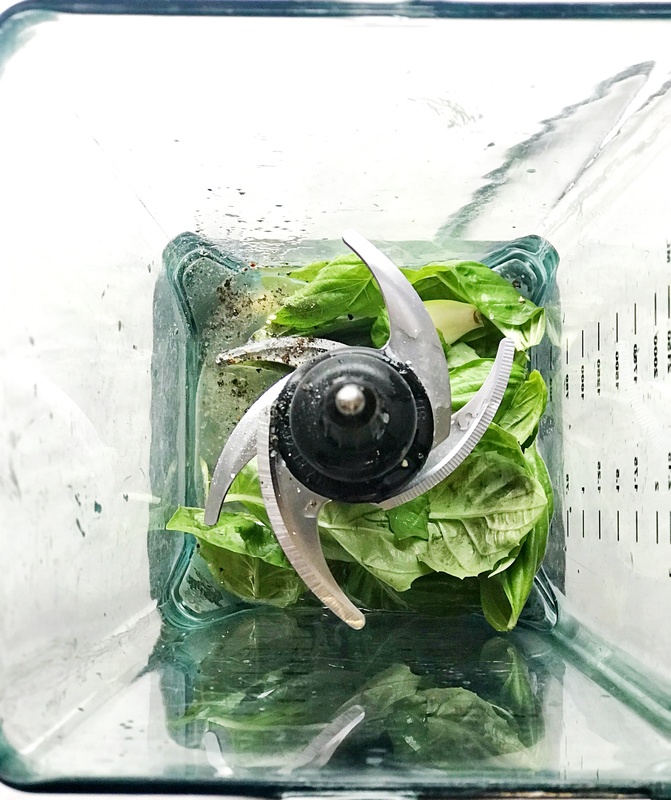 What type of spiralizer should I use? At the start of making your meal, begin by forming your zoodle nests. 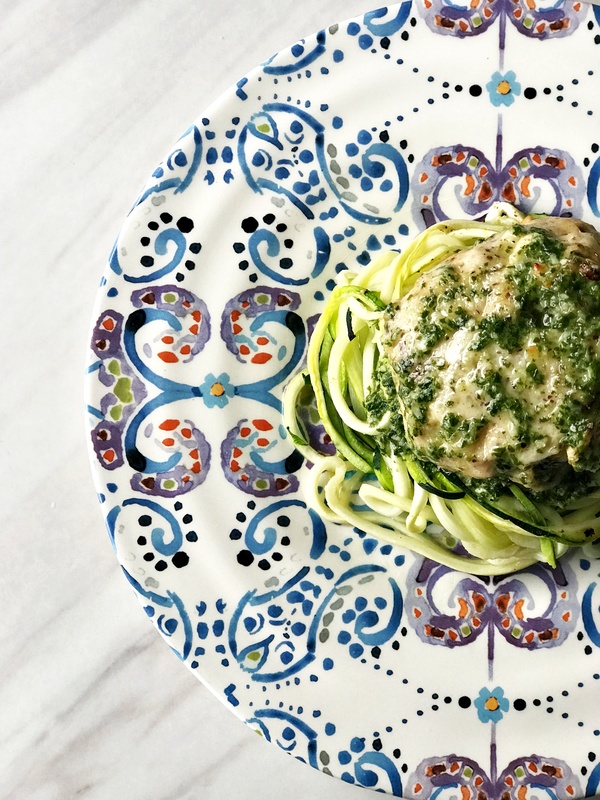 Take a handful of zucchini noodles and pull up off the counter. Cut the long strands with kitchen scissors, and lay off to the side in a pile. Using a fork, begin to twirl the pile of noodles at the center. Using the palm of your opposite hand, twirl the noodles against your palm to form a tight nest. Once your zoodle nest is formed, gently transfer to a parchment lined, or greased, baking sheet. I transfer mine by scooping up the bottom with a fork and cupping the outside with my hand. Form 6 zoodle nests with the noodles from 2 large zucchinis. Once transferred to baking sheet, spray the tops with olive oil or avocado oil and sprinkle with salt and pepper. 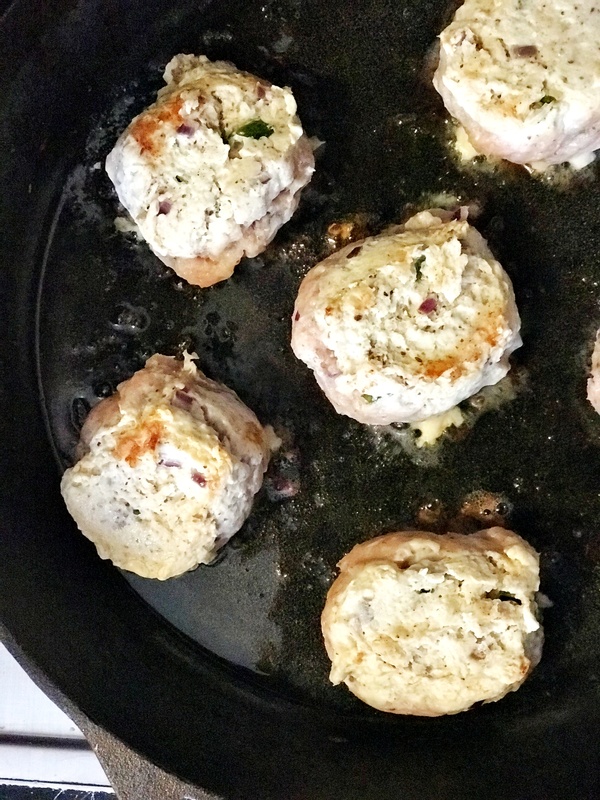 Set aside to bake at the same time as the turkey meatballs. Now onto our juicy turkey meatballs! Take all turkey meatball ingredients and add to a large mixing bowl. 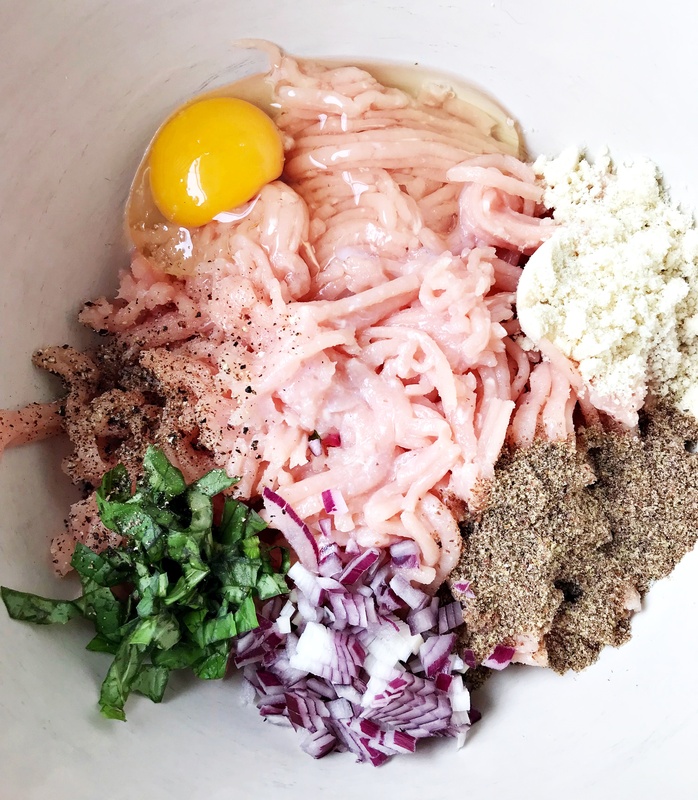 Using both your hands, mix together all ingredients by squeezing and massaging the ground turkey mixture (if you have kids, this is always a fun step for them to participate in!). Once all ingredients are incorporated, separate into 6 chunks, and using both hands, roll into a large ball. Place in a greased skillet or frying pan and brown tops and bottoms over medium heat. This shouldn’t take longer than 1-2 min each side. 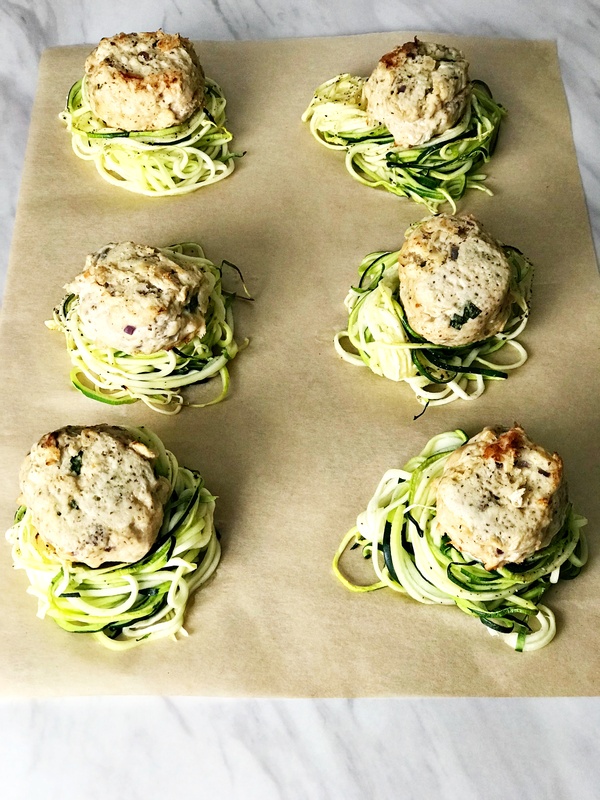 Take both your zoodle nests and meatballs, and transfer to a 350 degree oven and bake for 25 min (zoodles) and 20 min (turkey meatballs). Once finished baking, transfer zoodle nests to a plate, top with one meatball and drizzle with Basil Oil Dressing . 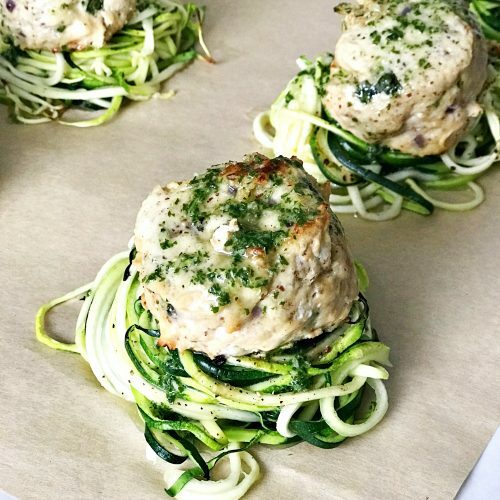 Juicy turkey meatballs in a zucchini noodle (zoodle) nest, drizzled with basil oil dressing. Healthy ingredients, keto, paleo, whole30, and gluten free! 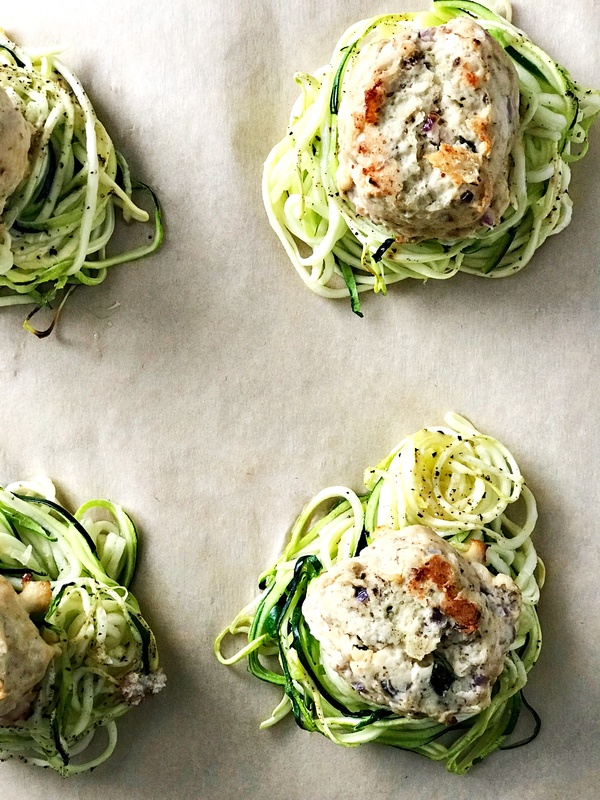 Preheat oven to 350 degrees F. While oven is preheating, prep zucchini noodles and meatballs. 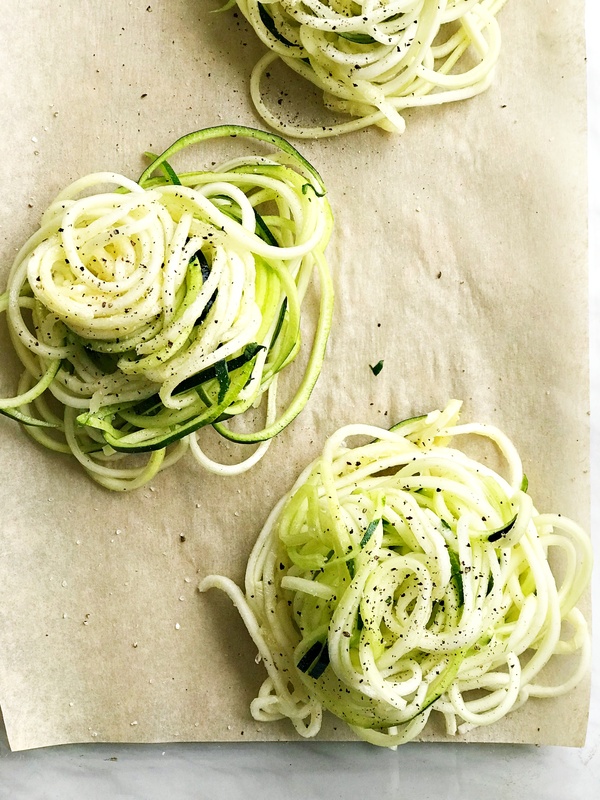 Using a spiralizer, spiralize zucchini into long noodle like strands. Once you have both zucchinis cut into noodles, begin to form into "zoodle" nests. 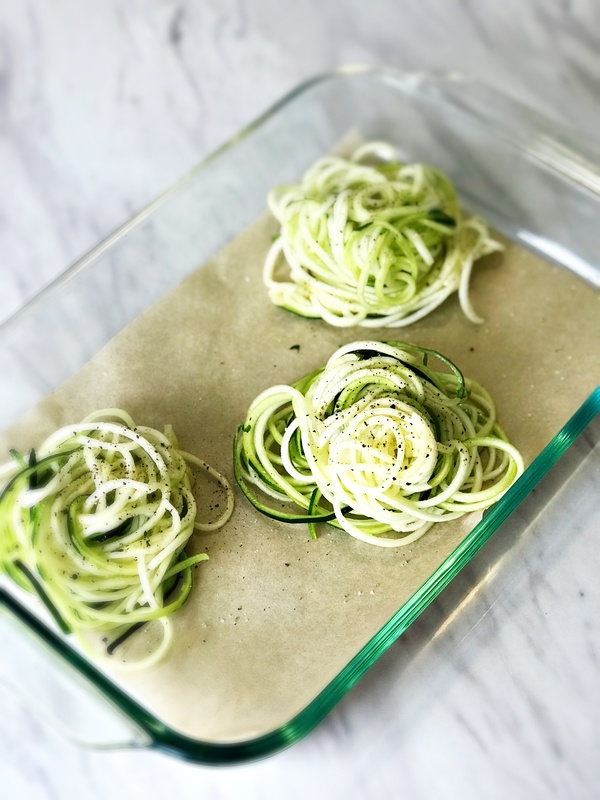 To form a nest, grab a handful of zoodles off the counter and cut the extra long strands with kitchen scissors. Stick a fork in the middle of your zoodle pile and twirl against the inside of your other hand. Keep twirling until a nest is formed. Use the fork to scoop the bottom of your zoodle nest and rest it on a greased baking pan or a baking pan lined with parchment paper. Continue until all zoodles are gone. Spray tops of zoodles with cooking spray, sprinkle lightly with salt and pepper, then set aside. Heat a skillet or frying pan with oil over medium heat. You will know its ready when the oil runs thin. Take all ingredients for the turkey meatballs and dump into a large mixing bowl. Make sure turkey has warmed up close to room temperature so not to freeze the coconut oil. Using both hands, mix ingredients together in bowl to form a large ball. Divide into 6 pieces and roll into balls for larger meatballs, or pull out smaller golf ball size pieces to roll into smaller meatballs. 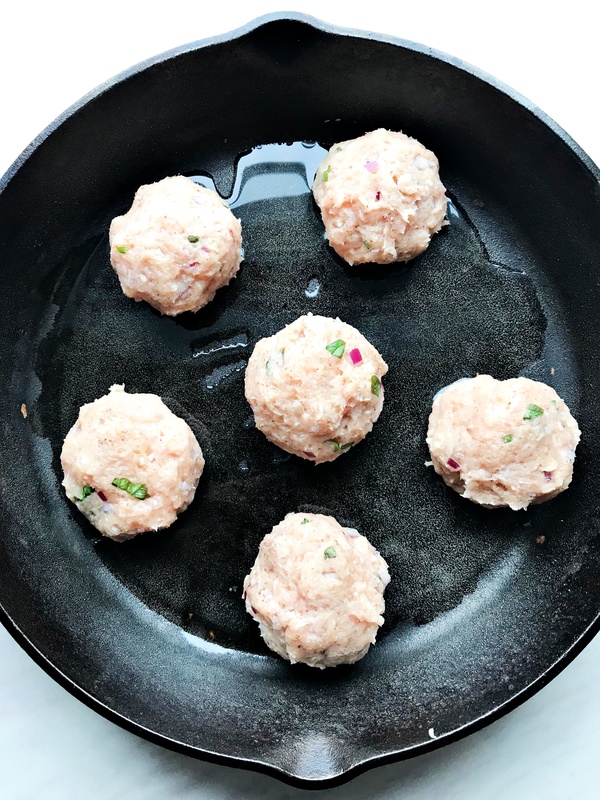 Once balls are formed, gently place on stovetop pan and begin browning. Cook on 2 sides for about 1-2 minutes each. When both sides are slightly browned, remove from stove stop. Transfer to baking safe dish, or use skillet and bake in oven for 20 min. Put your zoodle nests in oven for 25 min. 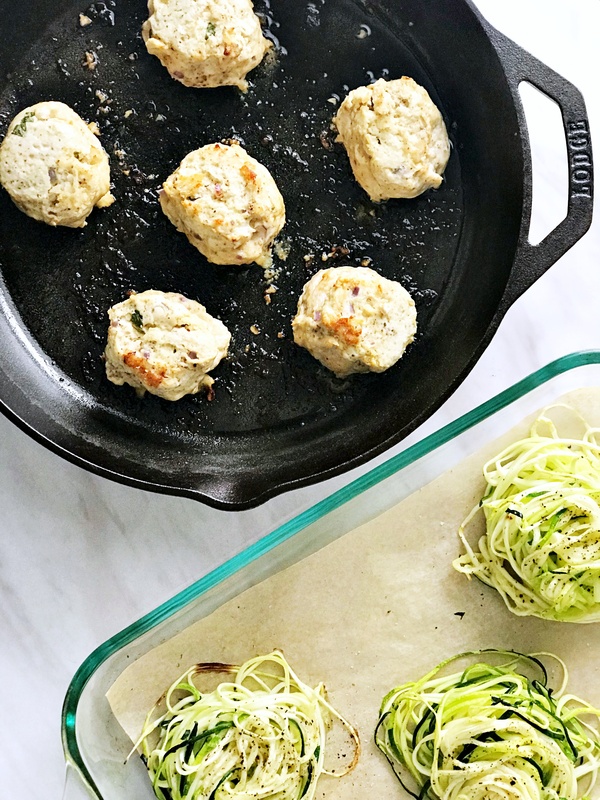 To save time, bake both zoodles and meatballs in the oven at the same time. When both are finished baking, transfer zoodles to a plate, top with a meatball, and drizzle basil oil dressing on top. Is it just me, or is it dang near impossible to find a salad dressing that doesn’t have any added sugar or preservatives in it?! I find this totally frustrating, because if I’m eating a salad it usually means I’m trying to eat healthy, and somehow those sneaky processed sugars find their way into my dressing! It’s like I can’t win! 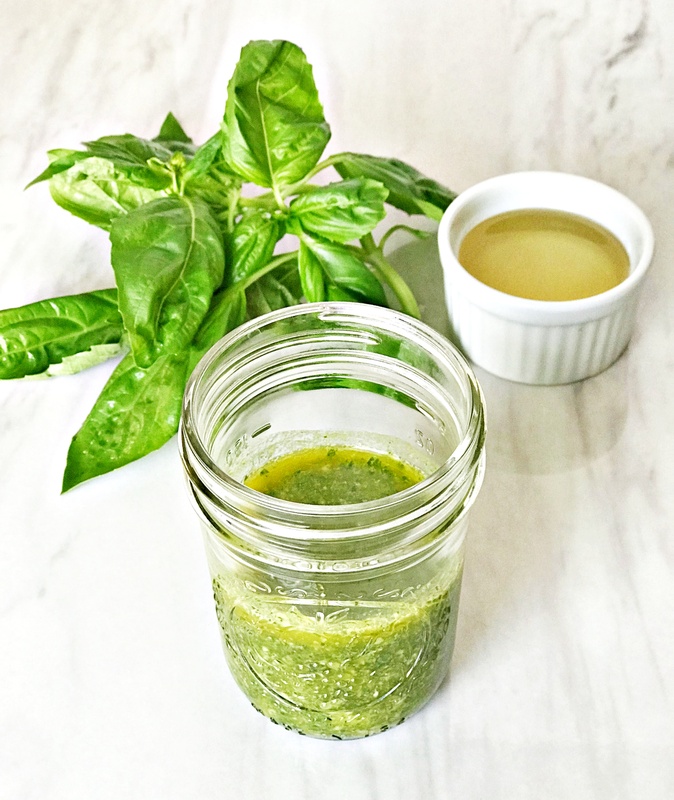 Eventually I had enough of it, and decided to make my own dressing with simple ingredients and no processed sugars. That way I know what I’m putting in my body and my salad can stay HEALTHY. The way it was intended to be! 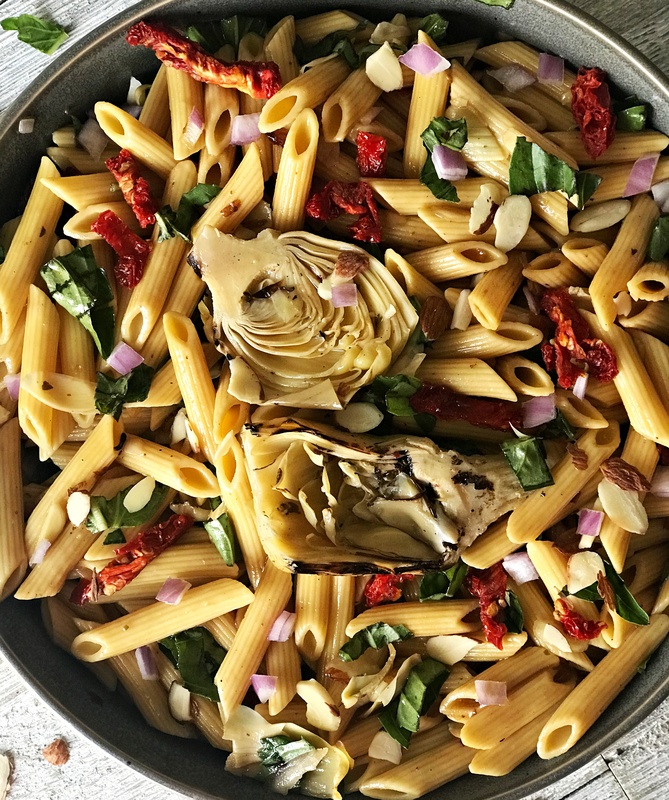 I’ll typically make a double batch of this and use it throughout the week on a number of different meals. 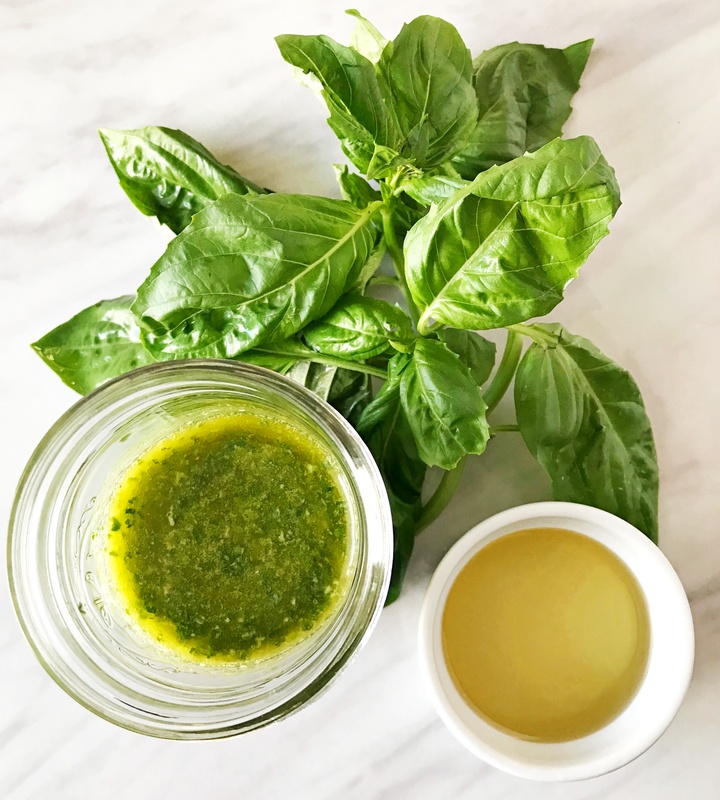 Not only can this oil serve as a salad dressing, but flavors all different kinds of food as well! 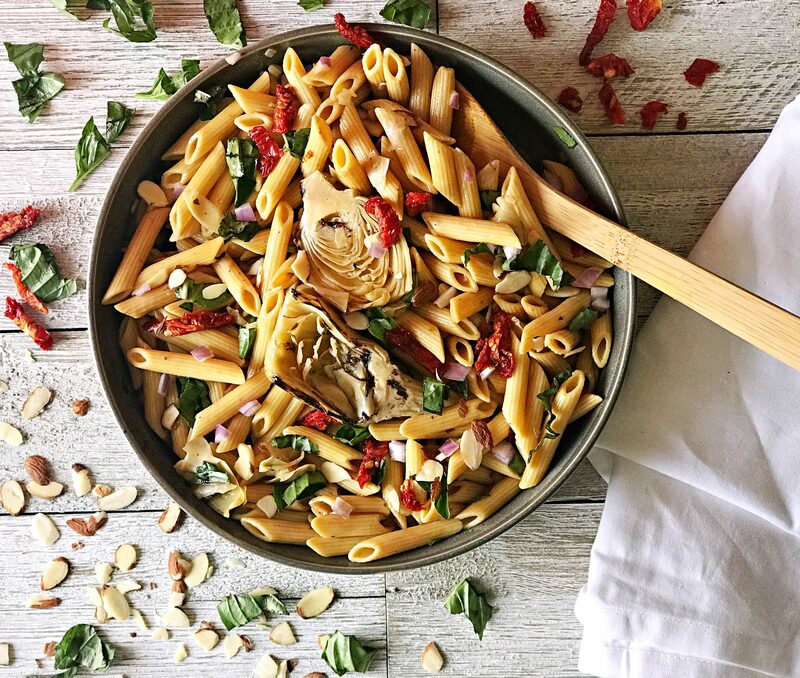 Meat dishes, pasta salads, veggies, and even omelets! 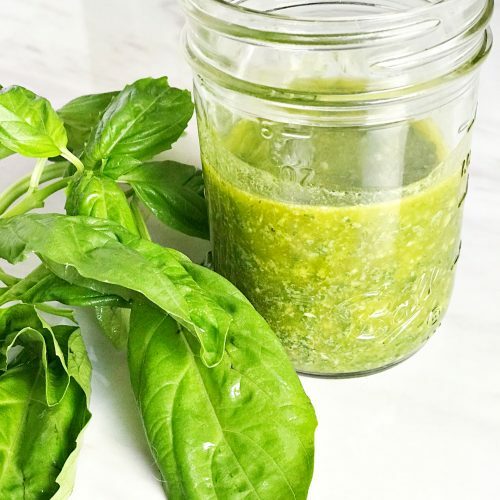 Pretty much anything that can benefit from some extra flavor or a healthy dressing…pour it on there! 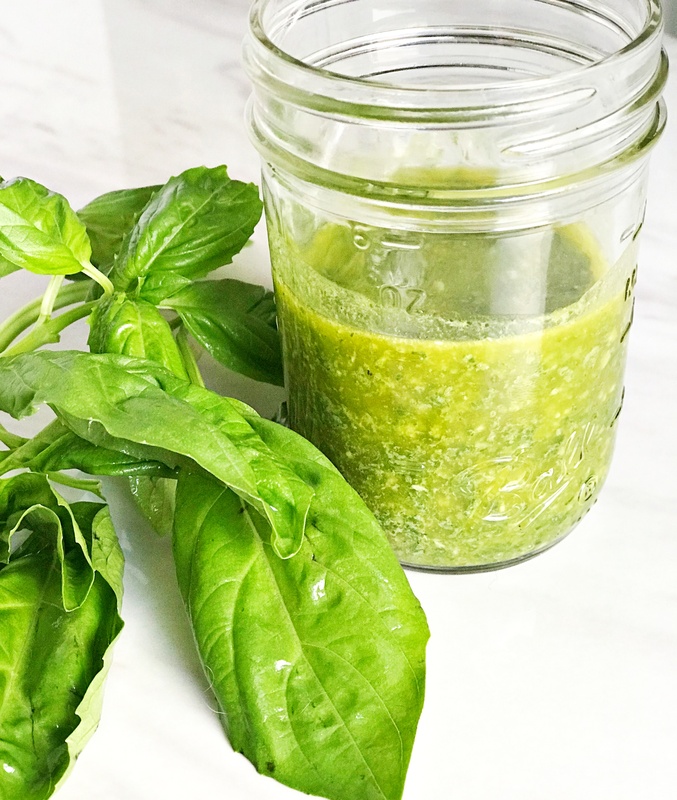 This oil is made entirely in the blender and consists of 4 main ingredients! Add all 4 ingredients, with a little salt and pepper (if you’d like), and blend until liquid is formed. Store at room temp for the week (do not refrigerate, as it will cause the oil to harden). Whole 30, paleo, keto, and gluten free approved! 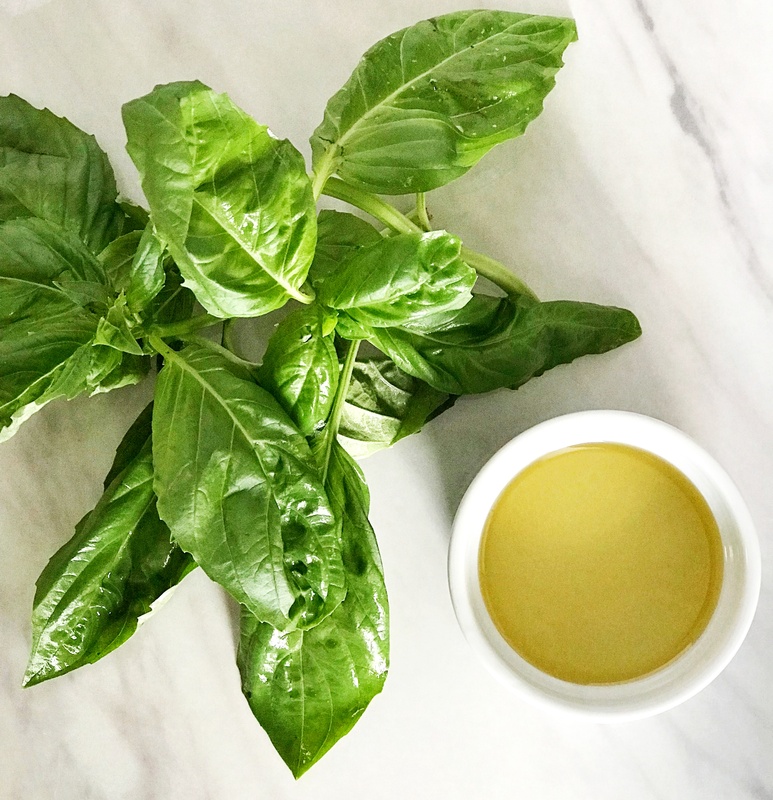 Can I use dry basil if I don’t have fresh basil leaves? You could, but I wouldn’t recommend it. The taste wont be as fresh since you won’t be getting oils from the living leaves. Luckily, most grocery stores carry basil year round and you can get yourself some in the produce section. 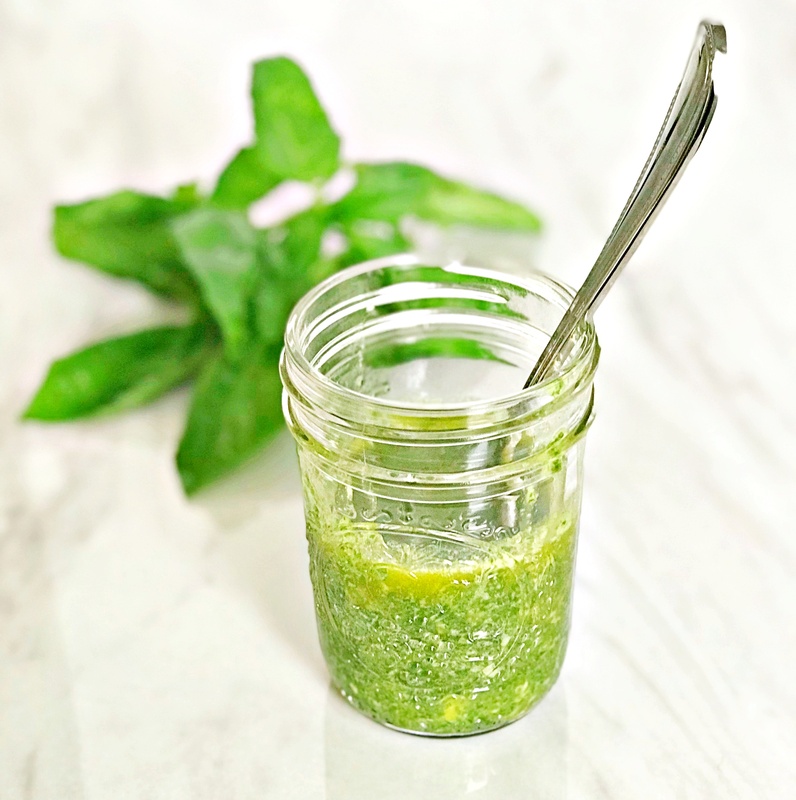 Simple, fresh, and healthy basil dressing! 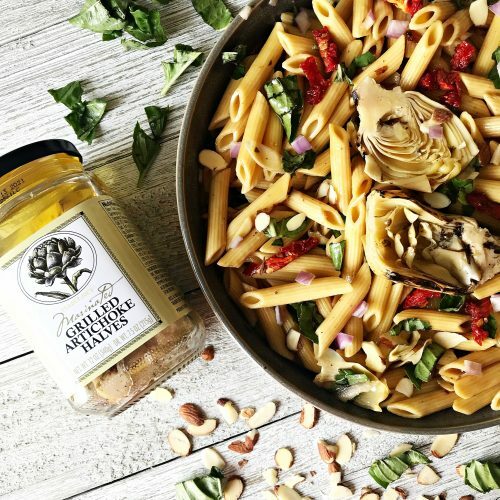 Can be used on salads, any meat, baked veggies and more! 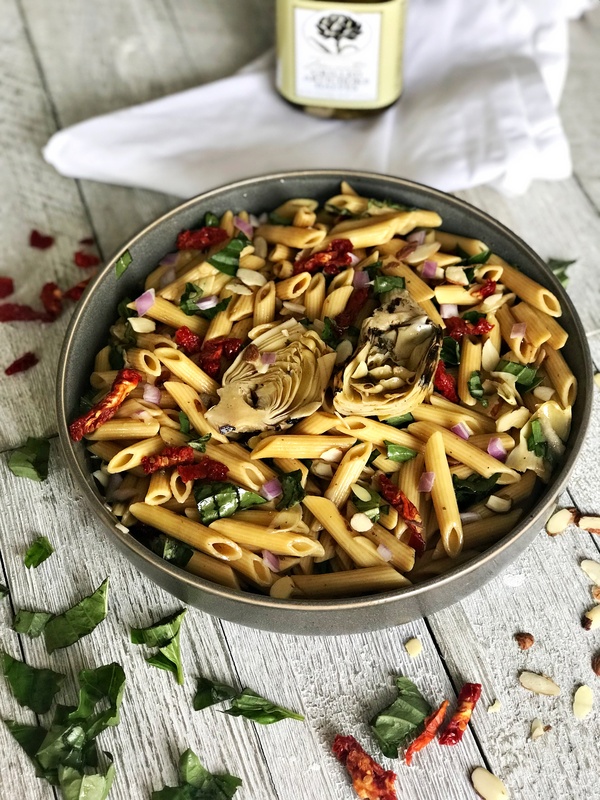 Gluten free, paleo, whole 30, and keto approved. Plus no added sugars or preservatives! Take all ingredients and add to blender. Blend until ingredients become liquified together. Store in a container (mason jar, glass bottle, etc.) and store in the fridge or at room temp for up to 1 week.